EABASSOC Waxproof is a semi-soft anti-corrosion coating for ferrous and non-ferrous metals. Waxproof is used to stifle inaccessible corrosion and is ideal for the protection of enclosed steel work, such as box sections, from rust. It is particularly suited for use on unprepared surfaces in circumstances where surface preparation is not practical, e.g. the box sections of motor vehicles, around bundles of cables, in ships' hulls and any other inaccessible places. Waxproof can be used as a preservative film during metal seam welding and is ideal for steel work exposed to severe salt weathering. Waxproof can also be used as a lubricant. EABASSOC Waxproof is a heavy duty wax-based surface sealer and is used as an anti-corrosion coating. It is a ready-to-use product which is normally applied by airless spray, but brushes and rollers can also be used. It is used on a variety of surfaces, including pipes, plant, equipment and parts, but is particularly suited for use on unprepared surfaces in circumstances where surface preparation is not practical, e.g. the box sections of motor vehicles, around bundles of cables, in ships' hulls and any other inaccessible places. EABASSOC Waxproof is reversible, which means that it can be completely removed once it is no longer needed. Furthermore, it can be left in place to act as a lubricant when plant and mobile equipment is re-commissioned after storage. The photograph below shows the effect that Waxproof has on rusted steel. This testimony to its performance has been confirmed by several applications on metal bars, box sections and in bridge engineering. 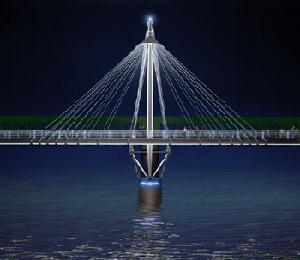 EABASSOC Waxproof has been used by two major civil engineering companies, Costain Norwest Holst and Macalloy Bars on the Hungerford Bridge Millenium Project. The two lightweight symmetrical footbridges over the River Thames are suspended a short distance either side of the existing railway bridge provide a stunning new landmark for London and are a major catalyst to the continued regeneration of the South Bank. EABASSOC Waxproof was used on a Sheridized steel mechanism which had to be allowed to move during installation on the bridge but also needed protection against corrosion. Waxproof was used because a lubricating, anti-corrosion material was required which would not drip or melt during use. EABASSOC Waxproof has been described as "very useful". Overall EABASSOC Waxproof is an excellent anti-corrosion coating which can be used in many applications, including pipes, plant, car underbodies, agricultural plant, garden furniture and maintenance equipment. Waxproof is particularly useful for application on boats and other marine equipment as its anti-corrosion properties are complimented with a high resistance to salt spray ( 5-7 years protection from salt spray). BI Engineering, - BI Engineeing uses EABASSOC Waxproof in applications for the Ministry of Defence and Vickers Defence Systems. In particular it is applied to box sections of launch rails - long rails of about 4-5m. The inside of the box section is coated to protect it and to allow an inner section to slide inside the box sections. Macalloy Bars - Hungerford Bridge Millenium Project. EABASSOC Waxproof was used on a Sheridized steel mechanism which had to be allowed to move during installation but needed protection against corrosion. Waxproof was used as a material was needed which would not drip or melt during use. It was found to be a "very useful" product. Costain Norwest Holst - Hungerford Bridge Millenium Project. TWI (The Welding Institute) - Protection of metal used in welding trials, during transit from TWI (a Research and Development Institute) to their client.